After a few hiccups with time off, childcare etc myself, Graham Harris and Martin Worgan managed to pick the wettest day of the year to cross Sarn Helen before Wales closes (don't get glum it's not all bad post nerc). A quick dash up to Brecon in Graham's trusty Astra saw us on the trail for 10:30'ish, we were a little late due to Graham being sick/unwell initially but some hot lemon soon sorted that. So off we splashed, two serrow's leading with Martin's stinkwheel at the rear so as not to offend other trail users i.e. me and Graham. Now, I've never been across this trail so a cautious approach was the order of the day. That was soon abandoned as we hit the cut and thrust of the A470 south and the do or die right turn at Tai'r Bull which saw us onto a nice uneventful UCR and up to Sarn Helen proper. This road has pretty much everything you would want, easing you in gently with a nice open common track with only shallow puddles to contend with, a small section of tarmac (albeit with a dodgy junction) sees you onto a nice hard track before getting onto the side of the hill where it turns into what we all love, rocky climbs, rocky descents, water splashes by the dozen and BMW's, lots of them HP2's, GS's and F650's filling the track with their bigness, 'good luck' was offered as advice and on we went on our wet merry way. I remember asking Graham about the trail beforehand and to be fair he did say there would be some fords but as the photo's hopefully show there was one that can only be described as a BIG'UN. 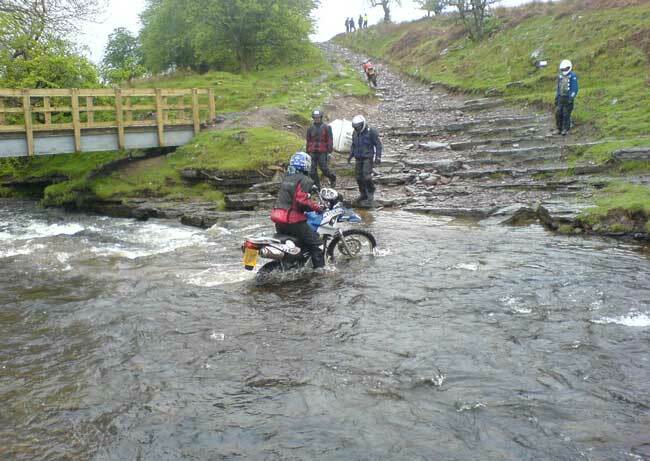 Much pondering was done, "lets push them across this new CRAG bridge proudly displaying ... no motor vehicle signs! Drat and double drat! 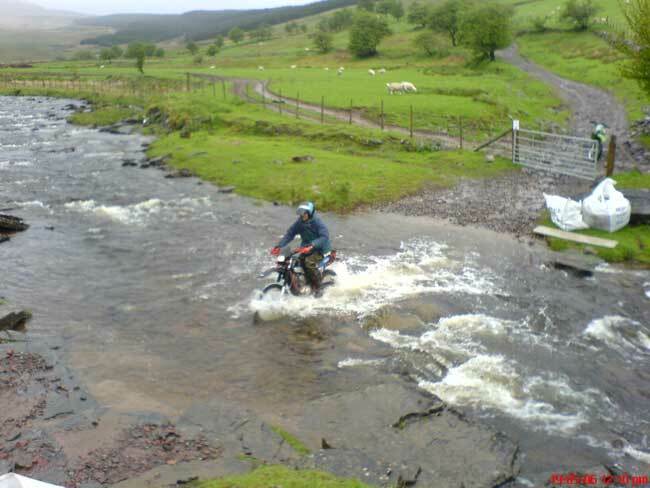 So with snorkels on in we went and quite successfully too until Martin stalled in the middle, rapid kicking ensued and a handful of throttle soon sorted things out. 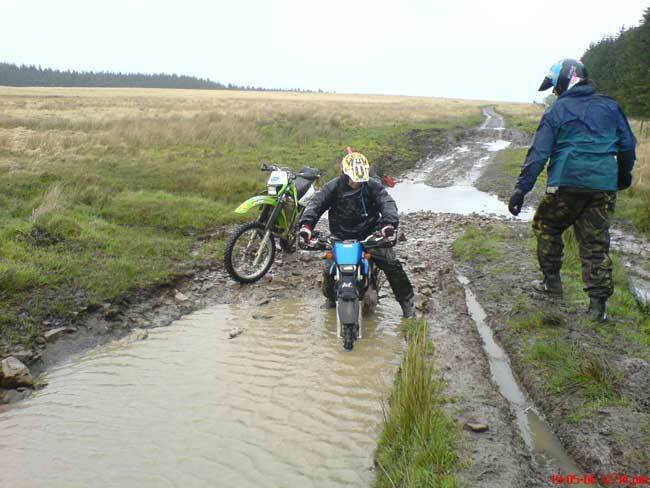 On and on we went, puddle, track, puddle, track etc. until the inevitable tarmac appeared, but whats this on our left? a weak bridge sign in a field! "I don't remember that!" say's Graham, a quick scan of the map shows it to be a RUPP "lets go" say's I, hey this is a nice track, right up until the BOG. Me, bogged down. Martin, bogged down. Graham, seeing us bogged down, takes to the high ground, curses, what had been a relatively clean run now saw two of us covered in s**t but hey it's still raining we will clean up in no time. So bog extracted, we carried on to Banwen where the road is a BOAT but only from May 31st to September, so made a note of that and returned to Brecon on the same route, but before that we made sure to watch Graham fall off on the local's practice track and attempt to descend the local's hillclimb (not nice, V steep) and come across the BMW boys crossing the BIG'UN on the way back, very amusing. So get out there in case it goes, hopefully with cooperation with the national park it may stay.